This page provides you with details of what we've updated and/or added recently across the Jag-lovers sites! It doesn't cover minor changes happening every day, just the major stuff- newest at the top. Please don't forget that it takes time and money to provide all the data on our 4000+ pages of Website and look after our very active 40,000+ Forum Members so your voluntary Donations are always very much appreciated and help us pay for the services we use! If you are a FireFox user, you can install our latest toolbar! A developing listing of OBD-II Codes and their meanings. Tabulated for both Generic and Jaguar-specific codes. Scanned original Jaguar Price Lists starting in 1948 through to the 1990s. These are the UK official versions issued by the factory. 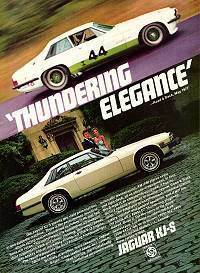 32 Additional magazine adverts from Jaguar's past! Our new line of Jag-lovers Regalia is now available through our very own Jag-lovers run eStore! Show your support by displaying a Jag-lovers Car Badge (three styles) - plus key fobs, decals and a windscreen sticker - supplies are limited so get in quick - everything is currently in stock! It's been a while since we added any new brochures but here are some 330+ new page scans from this year and last year across the UK model ranges with more to follow... Includes, S-TYPE, X-TYPE Saloon and Estate, XK, XJ and the optional R Performance add-ons. Enjoy and/or Dream On! Our old web search engine was showing its age so here's a new customised one that can locate most things on our web site within a couple of seconds. Remember that this one covers the www.jag-lovers.org sites - for the Forums use our dedicated Forum Search Engine. To keep your terminal looking pretty while you are doing paperwork or whatever nearby, we introduce our ScreenShow - a web driven rotating image display using screensaver techniques (but this runs in your browser and needs no installation as such). You'll see a new button at the top right of our main menu - select it, read the instructions/notes first, then enable it and run it when you want. Over 2400 quality 800 x 500px images to rotate in many categories that are always being added to! The full story, courtesy of Jaguar World Monthly and told by Paul Skilleter, of the 1980s attempt to develop and introduce the next sporty Jaguar - that failed. Riveting reading from the master of the art in three parts with many original images! Our new Wallpaper Store containing dozens of images for your PC or Mac desktop - mostly available from 800x600 up to 1600x1200 as good quality JPEG images. Sourced from Jaguar Cars Ltd themselves and our own resources, many never before seen on the web. A new section from Jag-lovers introducing the Concept Cars that paved the way for eventual models. Many fell by the wayside, others contributed to later production models. A section we hope to expand back into the past as time permits! Summary page that displays the most recent 25 posts to the Jag-lovers Forums! Selectable Forum coverage - saves you manually switching round our 24 Forums to find out what's new! Major redesign, internal and external, to speed up access for our growing membership!